Time rolls on and the end of the summer brings the beginning of the new Opera season in Cardiff, with La Bohème by Giacomo Puccini at Welsh National Opera. It seems like a thousand years since I last went to the Wales Millennium Centre but it was only May. Still, a lot has happened between then and now. 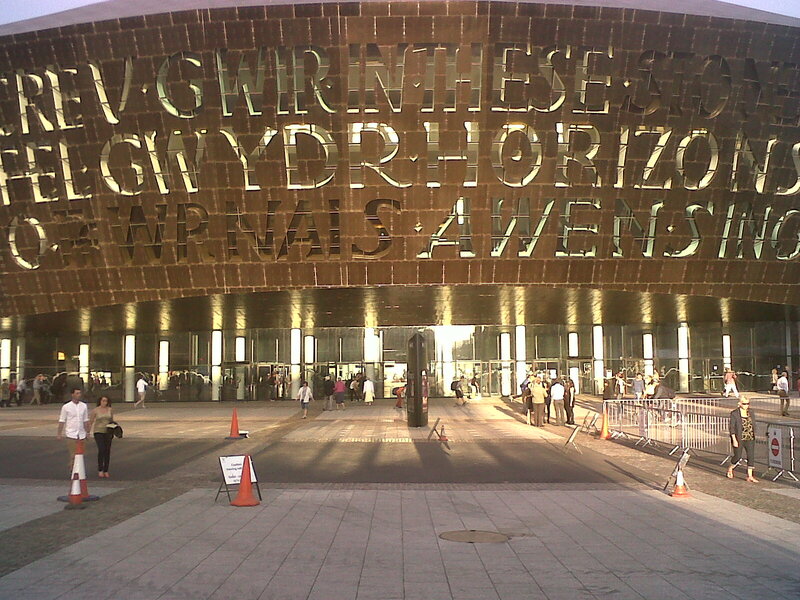 It felt good to see the Wales Millennium Centre again, looking resplendent in the sunshine of a September evening. Life’s getting back to normal. I confess that I still get butterflies in my stomach as I take my seat before a night at the Opera. I guess if that thrill ever disappears I’ll just stop going, but last night reminded me why I love the Opera so much. The performance was absolutely wonderful, perhaps the best I’ve seen at Cardiff since I moved here five years ago. The later stages of Act I are built around Rodolfo’s aria Che Gelida Manina (“your tiny hand is frozen”) and Mimi’s Mi Chiamano Mimi. These beautiful songs follow one another in quick succession, and are then rounded off with a wonderful duet O Soave Fanciulla in a manner guaranteed to melt the stoniest of hearts. And, before you ask, yes I did cry. Just a little bit. I don’t think anyone noticed. But it’s not just the ravishing music that makes this passage so special, it’s also Puccini’s gift as a story-teller: after the two arias by Rodolfo and Mimi, the audience knows everything they need to know about these characters. It’s a great example of why I think Puccini is a far greater writer of Opera than, say, Wagner. Puccini understood much better than Wagner how to vary pace and colour without allowing the story to bogged down, and he knew exactly how to use his big tunes to maximum dramatic effect (i.e. without excessive repetition). In fact, La Bohème is in four acts, but its running time is just about 2 hours and 15 minutes, packed full of gorgeous music and compelling drama. It’s a supreme example of Puccini’s artistry as a composer of Opera. Anyway, back to the plot. Act II finds Rodolfo and Mimi joining in the party started by Marcello and his buddies. There’s a huge contrast here between the dingy garret in which Act I is set, as this is set in the Latin Quarter of gay Paris (with a few drag queens in this production thrown in to make the point). Marcello gets off with the object of his desire, the coquettish Musetta (Kate Valentine), and all seems well with the world as we go into the interval. In Act III we find things have changed. Rodolfo’s love for Mimi has soured and, overcome by jealousy and suspicion, he has left her. Clearly unwell, Mimi wanders around looking for Rodolfo and he hears her coughing. They clearly still love each other, but find it difficult to live with each other. If Opera were Facebook they would both have “It’s complicated” on their status. The last act finds us back in the garret, Rodolfo and Mimi having separated. But Mimi has been wandering the streets in the freezing cold and turns up, clearly gravely ill. Rodolfo’s friends quickly pawn some meagre possessions and Marcello and Musetta rush out to buy medicine and summon a doctor. They return with the medicine but, before the doctor arrives, Mimi dies. Well, what did you expect in an Opera, a happy ending? People say that this is a romantic opera but it’s a pretty bleak story when you think about it. The lovers’ happiness is brief and it all ends in despair and death in surroundings of poverty and squalor. That’s what Opera Verismo is all about. And a word for the production. Annabel Arden’s design managed to bring fresh elements to what is basically a straightforward interpretation of the Opera. The visual effects, such as the animated snow, were clever but not intrusive. There was no attempt to translate the action into a different period or location nor was there an attempt to preach about disease as a metaphor for moral failings. In this respect it’s very faithful to what I think Puccini’s intentions were, i.e. to let the audience make their own mind up about what message they want to take away. The only slight departure I spotted was that in Act I Mimi actually blows her own candle out deliberately in order to get Rodolfo to light it again. Methinks she’s a bit more forward than usual in this production. This was the first performance of this run of La Bohème. If you love Opera and can get to Cardiff, then do go and see it. It’s very special.